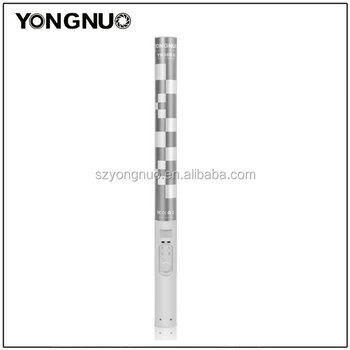 YONGNUO YN360II is the first LED video light equipped with built-in battery.It adopts high quality battery with super capacity of 5200mAh.It just takes 80 minutes for the built-in custom quick charge ship can be charged to 80% capacity.It is equipped with dedicated charger for the convenience for fill light.The light source adopts RGB full color patch lamps and two color temperature lamp beads,allows you choose the color as needed.You can also download the official APP,it will be more convenient to use mobile remote control. Built-in 5200mAh lithium battery, with fast charging module and quad protection circuit, just takes 80 minutes to charge the battery from 0% to 80%, save time and convenient.When in full charge,it could use for 2 hours at highest brightness of 3200k and 5500k color temperature pattern,or use for 4 hours at highest brightness in RGB full color pattern. Provide the full color RGB,you could choose the color as needed through the APP,or can adjust manually to create your unique color. Composed from the RGB full color mode and 3200k,5500k color temperature mode,dual independent modes operation,simple operation with one key to switch the mode you need. The YN360II panel length is up to 46cm,greatly improve the length of the light, which especially suitable for solid and wide angle light supplement. Selected 320 high quality lamp beads with large light emitting chip, color rendering index is greater than or equal to 95, perfectly restore the true color of the object. 1.Equipped with built-in 5200mAh lithium battery,which is more convenient for outdoor photographic use.When in full charge,it could use for 2 hours at highest brightness of 3200k and 5500k color temperature pattern,or use for 4 hours at highest brightness in RGB full color pattern. 2.Support external DC power supply for long time use,the applied voltage is: 12V 2A (do not use the laptop power supply). * Adopts LED digital display, display more stereoscopic, and the power output is more intuitive. *Adopts YONGNUO LED constant current drive technology specially developed for LED video light, stable lighting intensity straightforward, photographic effect is more reliable. *The YN360 II provides two versions for option, white version formed by 320 LED lamp beads with 5500k color temperature and 40 RGB SMD lamps. Bi-color version formed by 160 LED lamp beads with 3200k color temperature,160 LED lamp beads with 5500k color temperature and 40 RGB SMD lamps.